Remember yesterday when I said I don't make resolutions? That was true, however I do set goals, and one of mine for 2018 is to blog three times a week instead of just two. I also wanted to bring back a series of posts from last year (I called them "ageless outfits") in which I recreate a look that I've pinned to my Outfit Ideas for Ageless Style Pinterest board. So here we are! This week's look is one of my most repinned pins ever (with 500 saves and counting! ), and it's not hard to see why: it's simple, classic, and totally chic, but with enough details to make it interesting. Here's how to put it together. The key piece here is obviously the turtleneck—hers is slouchy and slightly boxy. 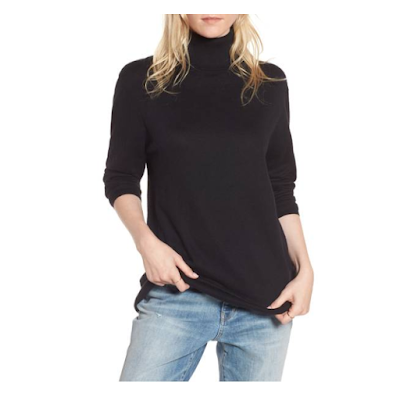 Ayr makes a pretty much perfect version, but most of the sizes are sold out and it's a little on the spendy side, so I recommend this boyfriend-fit turtleneck from Treasure & Bond instead. Next, you'll need a pair of ripped skinny jeans in a light wash. You probably already have a pair at home, but if not, try Levi's 721 high-rise skinny distressed jeans. I've been on a premium denim kick for years but have lately come back around to Levi's and feel like they're unbeatable, especially for the price. The photo above is a little cut off, but the woman is carrying what looks like a saddle bag by its shorter, top strap. 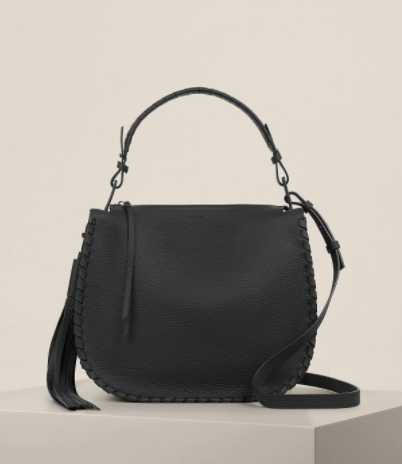 This AllSaints moto hobo has a very similar shape and is, luckily, on major sale. 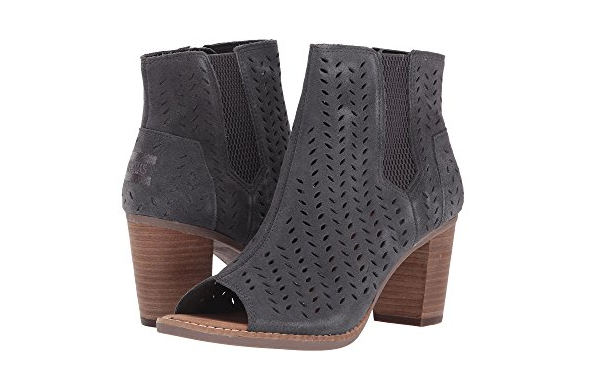 Finally, the woman in the photo is wearing gray peep-toe booties, which are probably not practical in most of the country at the moment...unless you live in California like I do! I like the perforated texture on these TOMS Majorca booties, plus the 2.5-inch heel is totally manageable. I love black tops with jeans and this is the perfect late fall/ early winter outfit. Pinned. I love the look! Thank you for breaking it down! I love the original look and I think I have it pinned, too! It is fun to see which pins go viral. I have been wanting those TOMS booties, but yeah... I am going to have to wait until it warms up! Lol! Love this look! 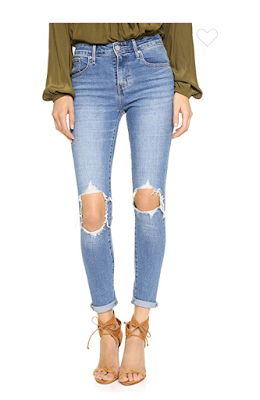 I think I need a new pair of distressed jeans too. I love the ones you linked to! Great picks. Those black tops are pretty. I love their casual and chic style.